The author, a critic and art journalist, reports on a November 2018 conference in Berlin organized by the German Lost Art Foundation on the 20th anniversary of the Washington Principles, which are voluntary guidelines for resolving disputes over Holocaust-era looted art. The U.S. and Germany issued a joint official declaration reaffirming their commitment to the Principles. The Ninth Circuit Ruling in Favor of the Norton Simon Museum – Is This the End to the Dispute over Adam & Eve? 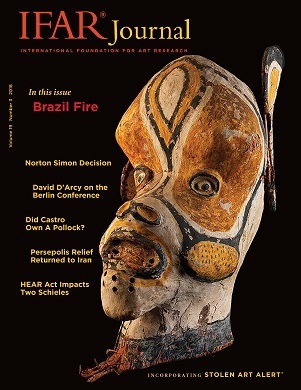 In an update on a case covered extensively in the IFAR Journal, the authors, both art and cultural property attorneys, discuss the Ninth Circuit’s affirmation of a California district court decision that two Cranach paintings, which the heirs of Jacques Goudstikker had sought to recover, can remain at the Norton Simon Museum. The Ninth Circuit has subsequently denied the claimant’s petition for rehearing. Did Fidel Castro Really Own a Pollock? IFAR’s Art Research Director discusses IFAR’s research concerning a purported Jackson Pollock painting submitted to IFAR’s Authentication Research Service twice in a five-year period by two different owners. It was accompanied by a false provenance linking it to Castro’s Cuba, including false documentation and “doctored” photos. IFAR had recently dismissed another painting with a similar inscription but a different false provenance and documentation. It is likely that other fake paintings are involved in the scam. David Campbell, a member of IFAR’s Board of Directors for more than 20 years, is remembered. A discussion of Williams v. National Gallery of Art, London, wherein the heirs of Oskar Moll, a non-Jewish German collector whose Matisse painting was allegedly stolen in 1947, sought to recover the work from the museum. After the U.K.’s Spoliation Advisory Panel ruled that it lacked jurisdiction to hear the claim because the alleged theft took place so many years after the war, the heirs filed a suit in a New York court against the National Gallery, the U.K., and The American Friends of the National Gallery of Art, London. The story of the “Persian Guard,” a limestone relief that disappeared from an archaeological site at Persepolis in 1935, was later donated to the Montreal Museum of Fine Arts, from which it was stolen in 2011, and, after recovery, was sold by the museum’s insurer to London antiquities dealers in 2016. When the dealers exhibited it an art fair in New York in 2017, the “Antiquities Trafficking Unit” of the New York County District Attorney’s Office seized the relief. The dealers claimed they had purchased the relief in good faith and that its provenance had been unquestioned. A summary of recent activities at the U.S. State Department’s Cultural Property Advisory Committee. These include: an extension of the Memorandum of Understanding (MOU) with Cambodia restricting the importation of certain cultural object into the U.S.; discussions regarding the extension of MOUs with China, Honduras and Bulgaria; and a meeting to review new applications submitted by Ecuador and Algeria. An update on a case reported on previously in IFAR Journal (see Vol. 18, nos. 2&3 and Vol. 18, no. 4), Mayor Gallery Ltd. v. Agnes Martin Catalogue Raisonné LLC, which concerned the rejection of works submitted to the catalogue raisonné committee. In April 2018, the case was dismissed by the New York Supreme Court. The parties, among other updates, are currently litigating the issues of attorney’ fees. A discussion of Frenk v. Solomon, a case wherein the heir of Paul Westheim, a German-Jewish collector who entrusted his collection to a friend before he fled Germany in 1933, is suing the heirs of that friend for the recovery of four Expressionist paintings. Crucial to the New York Supreme Court decision was the wording of a contract signed by Westheim’s widow years before. A discussion of a recent court decision regarding a Holocaust-related ownership claim for two Egon Schiele watercolors once owned by Fritz Grunbaum. The case was decided in part by the 2016 Holocaust Expropriated Art Recovery Act (HEAR Act). Experts disagree as to whether the works were in fact looted, but the New York Supreme Court ruled in favor of the Grunbaum heirs. Outmoded fire prevention systems played a role in a disastrous September 2, 2018 fire at Brazil’s National Museum in Rio de Janeiro, but some prized artifacts have since been recovered. An update on a case reported on previously in IFAR Journal in which the heirs of a consortium of German-Jewish art dealers are suing Germany for the restitution of the Guelph Treasure, a collection of valuable medieval relics, which, the heirs assert, their relatives sold under Nazi duress to the state of Prussia in 1935. Discussion of a second successful infringement lawsuit by a French photographer against the artist Jeff Koons connected to a 2014 Koons retrospective at the Centre Pompidou in Paris. In July 2018, it was announced that the Artists Rights Society had acquired the repertories of all artists represented by VAGA. In an update on a story covered previously in IFAR Journal, Italy’s highest court ruled in December 2018 that the ”Getty Bronze,” a Statue of a Victorious Youth, should be returned to Italy by the J. Paul Getty Museum. The museum is contesting the decision. Stolen items include Josef Albers’ Study for Homage to the Square: Teen Age; Cy Twombly’s Delian Ode 41; two sculptures by David Gilbert, In the Presence of Mountain Hares and Laburnum 3-Piece; Jan Van Kessel’s Allegory of Earth/Animals. Recovered items include Emma Sandys’ Portrait of Mary Emma Jones, stolen in Norfolk, England; Hubert Robert’s The shipyard at Civitavecchia, stolen in Brussels, Belgium; Henry Moore’s Upright Motive E, stolen in London, England.